Start by browsing the Service Menu below and if you don't see a topic that is relevant to your needs, book a free consultation here. Do you usually skip breakfast or grab a bagel on your way to work? Start the day on a bright note! My breakfast options are protein and fat balanced so they will sustain you all the way through lunch time without the need for an 11'o clock sugary snack! How often do you eat greens? Do you eat enough variety of vegetables or the same old spinach and lettuce every week? I will share with you all my easy tricks to sneak greens and veggies into your life, from making green smoothies and green soups to baking, steaming and sauteing veggies. Making your own dressings, condiments and vinaigrettes is much easier than you think! Having 1 or 2 simple dressings on hand is the secret to whipping up meals on the fly during the week! Are you eating too much pasta, white rice , noodles or bread? Your grains will never be white again! Are you eating too much meat? Or are you a vegetarian not eating enough protein? Beans, lentils, tempeh and tofu are great plant-based protein sources that will help balance your diet. How do you get through the 4 pm slump at work without dipping into the cookie jar? I will show you how to prepare simple snacks you can bring to work or carry with you while you are on the go. Are you scared of the pressure cooker your mom used to have 30 years ago? The 21st century updated version is called the Instant Pot - it cooks brown rice, lentils, dried beans from scratch (even without soaking) within minutes. This is the one kitchen tool that has completely changed my life! Is your pantry full of expired condiment jars and random packets of sugar and pasta? 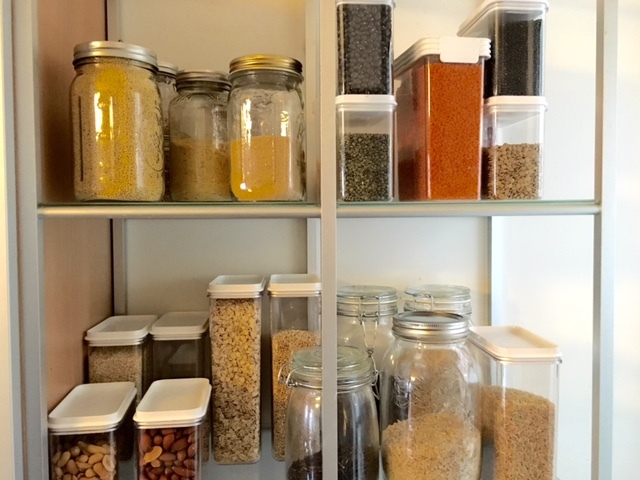 I will help you update your pantry and kitchen with basic ingredients and essential tools to make cooking more efficient and less overwhelming. Cooking a meal from scratch every time is exhausting! Learn the art of balancing weekend prepping, weekday meal assembling, following recipes and cooking on the fly.